It’s Monday again! Hope everyone had a great weekend and a great holiday if you celebrated! With a rash of movies coming out that are based on books (Water for Elephants, The Help, Something Borrowed), and because I went with my book club girlies to see Water for Elephants over the weekend, that today would be a good day to talk about adaptations (and I’ll also sneak in a little bit about my thoughts on Water for Elephants). I don’t remember what the first adaptation of a book I saw. It’s a practice that has been in place forever, and it makes so much sense. I mean why wouldn’t you want to make a movie out of an already successful book? You have a built in audience, and the story is already there for you. I do know that I’ve found a few books AFTER seeing a great movie. In fact I found one of my favorite authors, Maeve Binchey, after watching the movie Circle of Friends. But how many times have we been sitting in a theatre, bouncing in our seat, waiting for the long anticipated movie version of a favorite book only to be disappointed that a favorite scene or character was completely left out? So it’s always a gamble when you head to the movies to see what Hollywood’s interpretation of your favorite book is going to be. While I was at RT in Los Angeles a few weeks ago, I attended a great panel about going from the written page to the big screen (I mean like every author out there I have the pipe dream that I will see Kellan playing Gideon!) and it gave me so much insight into how and why Twilight ended up the way it did! One thing that they said was for an author NOT to try to write their own script. A novel and a screenplay are two different beasts and often when a book is adapted for film there are brutal decisions made that an author just can’t do. I know that I could NEVER make the decision to kill off one of my characters, or lose a detail that I struggled so hard to get just right! I mean just the editing process had me in tears and defensive. So, seeing one of my favorite books come to life on the big screen over the weekend had me looking at it from a different angle. And, I will say that I think that this is probably one of the adaptations that I have ever seen! Were there parts that were left out? Yes, absolutely. BUT, the screenwriter found a way to still include the information. And the fact that there is no Uncle Al in the movie and I really didn’t miss him says so much! I get it now, however. The next one that I’m waiting for to see how well they have adapted (and it will be very interesting because in the case Suzanne Collins had a hand in writing the screenplay, so I’m curious to see how much it differs from the book) is The Hunger Games. There are definitely a few that I want to see in between now and then including Kathyrn Stockett’s The Help, which is next on my TBR list. And of course I’m still waiting to see Indivisible! 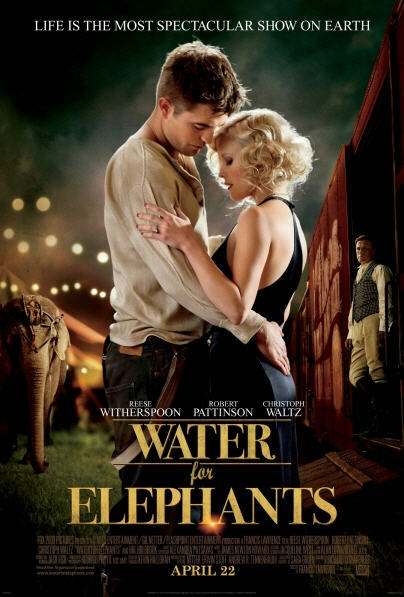 STOP HERE IF YOU DON’T WANT MY THOUGHTS ON WATER FOR ELEPHANTS!! Like I said, I really thought that this was a beautifully done film. Director Francis Lawrence did an amazing job of creating the 1930’s circus with all its spectacle for viewers. I thought visually the movie was just beautiful. I don’t think that they could have found a better actor to play August than Christoph Waltz! For me, he really stole the movie. Though I will admit that I wasn’t unhappy with seeing Rob Pattinson’s beautiful face on the screen for two hours! And he really did a great job bring Jacob to life for me. The one stumbling block for me in the movie was Marlena. Don’t get me wrong, I love Reese Witherspoon, and I think that she did a good job with the role, but I just didn’t like the character as much as I did in the book. The book version of Marlena was more of an innocent in the whole story. She thought that she was in love with August at 17 and basically ran away with the circus with him, leaving behind her disapproving parents. And then, once she discovered the dual personalities of August she did what she had to do to keep things even keel because she knows she can’t go back to her old life. In the movie, they gave her a different background involving foster homes, which still left her with nowhere to go, but to me lost something in the translation. The book version seemed more tragic for her because she chose August over her family, where in the movie he more saved her. It was one adaptation that I didn’t see the necessity for. Also, I felt that I missed Marlena and Jacob actually FALLING in love. One minute she would be draped over August talking about all of his great qualities and then the next she was jumping off a train with Jacob. I missed the tension that built in the book when we, as readers could see that they were moving beyond a point of no return, yet still had to act like there was nothing between them and how hard it became over time. There weren’t enough stolen glances between the pair, or “accidental” touches that they tried to conceal…I wanted to feel that they were willing to risk everything (including their lives) for love, and I didn’t. Everything else about the movie, however was stunning and amazing, and I’m fairly sure that I will sneak off in the middle of the day while the kids are at school over the next couple of weeks to see it a few more times! And now, since it's Monday...you all know what that means!! BLOG HOP!! Hey Jessica, I'll have to remember to come back to read your thoughts after I see the movie since I'm waiting to go with my book club to watch it. I saw another adaptation this weekend, Atlas Shrugged, which was quite interesting. The book's so big that it's part one of three! I'm going to see the movie next weekend with my book club...I'm a bit nervous! I hate to admit it, but I haven't read WFE yet or seen the movie. I'm going to Netflix it, though, and the book is on my shelf. The movies are never as good as the books, but some do come close. For me, the Lord of the Rings movies are examples of how to do an adaptation right. They respected the source material, and even though there were changes to the story, everything translated well on screen. And they were long; the filmmakers wanted to do the books justice, so they didn't limit themselves to, "Hmm, how long will the audience sit here for?" The Harry Potter movies (at least the last ones...4 through 7 part 1 so far, have done a pretty good job as well, but I wish they were longer to put more of the magical world we fell in love with in the movies. Easter Hoppin' Blog Hop Giveaway!